Result: Denis Kudla defeated Yuichi Sugita by 6-2, 7-5. The 25-year old, Denis Kudla took a perfect start in the first set and finished it by winning from 6-2. 109th-ranked qualifier @DenisKudla rallies from 2-5 down in 2nd set to beat Yuichia Sugita 6-2 7-5 in #GerryWeberOpen QF. Kudla into 2nd @ATPWorldTour SF and 10-0 in sets this week. @RogerFederer or [SE] @MattEbden awaits. However, Yuichi Sugita fought back in the next set but despite his good efforts, he still lost the set by 7-5. 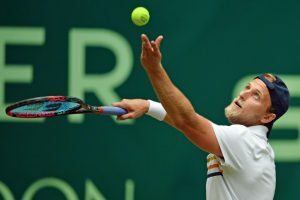 Denis Kudla finally made it to the Semi-final of the Halle Open 2018 where he will face the current World No.1 Roger Federer. Result: Roger Federer defeated Matthew Ebden by 7-6(2), 7-5. Both the players gave their best performance in the opening set of the match as it came to a tie-breaker. Roger Federer eventually won the first set on the tie-break as Matthew failed to score three more points on his serve. However, Matthew Ebden struggled hard to win the second set but Roger Federer again dominated him and won this set by 7-5. The 🇨🇭 was made to work for the second day in a row, but he beats Matthew Ebden 7-6(2), 7-5 @GERRYWEBERWORLD as he continues pursuing 🏆 No. 10 in Halle. 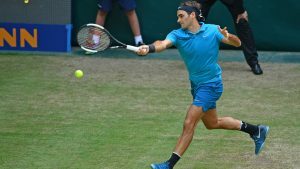 It was Roger Federer’s 19th consecutive win on the grass court as he has now reached the Semi finals of Halle Open 2018. Roger Federer will face Denis Kudla in his next match. Result: Roberto Bautista Agut defeated Karen Khachanov by 6-3, 6-7(3), 6-3. Roberto Bautista Agut took a great start as he clinched the victory in the first set in a dominant fashion. No. 4 seed @BautistaAgut beats Karen Khachanov in 3 sets to become 2nd Spanish semi-finalist in 26-year history of #GerryWeberOpen. @CharlyMoya reached Halle SF in 1999. However, Karen Khachanov came back in action and won the second set on the tie-break. In the decisive set, the Spaniard, Roberto Bautista Agut managed to win the set by three points as Karen lost some of his points on serve. 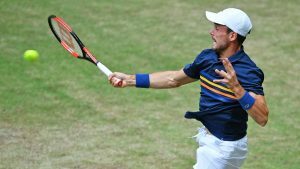 Roberto Bautista Agut has now advanced to the Semi finals where he will face the Croatian, Borna Coric. Result: Borna Coric defeated Andreas Seppi by 7-5, 6-3. Both the players gave an exceptional performance in the first set but eventually it was Borna Coric who sealed his win in this set. You or @BautistaAgut whoever is in the final, have a great chance to save tennis by wining in the finals at Halle. Andreas Seppi, however, lost the opening point of the second set on his serve and ultimately he faced a humiliating defeat in this set too. 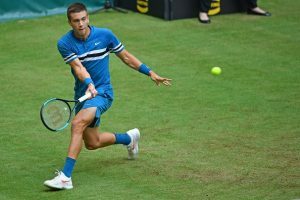 Borna Coric booked his place into the Semi finals of Halle Open 2018 where he will face Roberto Bautista Agut. Result: Marcelo Melo and Lukasz Kubot defeated Ivan Dodig and Rajeev Ram by 6-7(5), 6-3, 12-10. A stunning performance was seen in the first set by both the pairs as it came to a tie-break. Marcelo Melo and Lukasz Kubot lost the first set but they eventually won the next set after giving a better performance. Ivan Dodig and Rajeev Ram took the lead in the decisive set but finally the victory was sealed by Marcelo and Lukasz in this set. Marcelo Melo and Lukasz Kubot made it to the finals of Halle Open 2018. Do join allsportspk to see the highlights of the 8th day of Halle Open 2018. Previous articleBreaking World Cup 2018 – Nigeria Vs Iceland: Who Won…? Next articleBreaking World Cup 2018 – Serbia Vs Switzerland: Who Won…?